When today's exhibition for Convoys Wharf revised proposals was announced a couple of weeks ago, a lot of people complained about the fact that they would be away and would miss it. Well don't lose too much sleep over it - you didn't miss a lot! I went along briefly and picked up a brochure, but didn't hang around because there wasn't anything on the display boards that wasn't in the brochure, and not much detail to be seen. Since submitting an outline planning application to the London Borough of Lewisham in November 2010, a number of design reviews have taken place, involving both Lewisham Council and the GLA. What exactly does all this flim-flammery mean, and what else has changed since last time? The 'revisions' that the developers have actually pointed out, as the cynics among you will not be surprised to learn, are basically smoke and mirrors dressed up as 'revisions'. If the area around the double dry-dock has increased in size, it is by a very small percentage (not specified but I'm comparing the two plans - the previous one here and the new one in the brochure, which I intend to post as soon as I have a digital version). 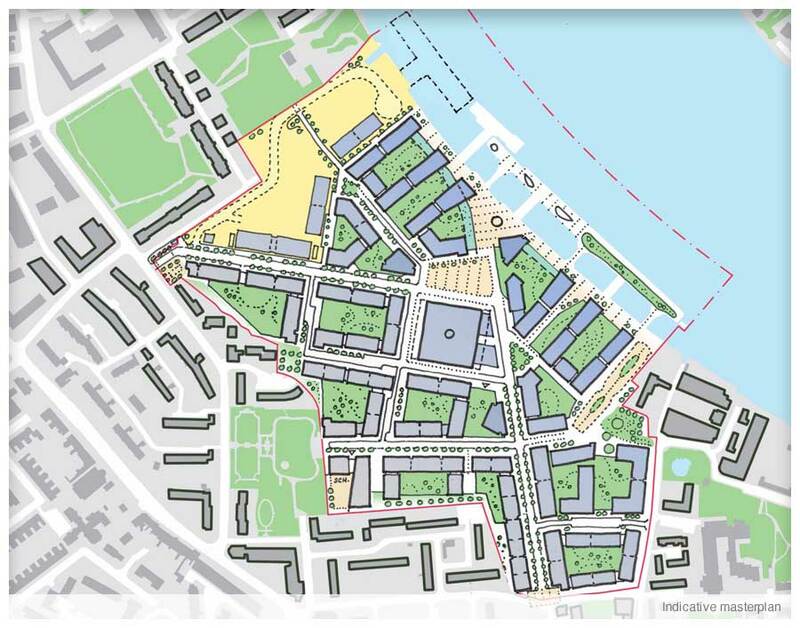 The fact that the developers are still focussing attention on about the area around the Olympia Warehouse (which is a listed structure and they legally have to retain and protect it) and ignoring the hugely more historically-significant remains of the Royal Dockyard (still mostly buried, its full extent not confirmed and no commitment from any government bodies to investigate further) demonstrates where their priorities lie. The brochure states that the heritage and cultural history of the site will play an important role in the development of the detailed proposals, but fails to say exactly how, except that it will 'reflect and reinterpret' that heritage. I don't really like the sound of that, do you? The brochure also has a big section about affordable housing, since it seems London & Quadrant has been brought on board as the affordable housing partner in the development process. But 500 affordable houses (and we all know that 'affordable' is a very flexible concept) out of 3,500 total units is woeful, if I might be so presumptious. About 15% for those who don't have a calculator to hand, which is way less than the 25% they were touting last time. I'm not sure what Lewisham's current target for affordable housing quotas is, but I'm damn sure it's not as low as that! I was also very interested to see that the introduction to the brochure, focussing on The Masterplan, has given the details of the outline planning application and its various types of land use in square footage, casting us back into the mists of Imperial units. This is very curious. Or perhaps not; my inner cynic advises me that it's just to make comparison with the previous application a bit more onerous. And my inner cynic has also warned me that this is probably because they have got something to hide. Well here it is folks: I've done the maths, as they say, so you don't have to. Check it here if you wish. Of course there may well be an 'innocent' explanation for this, but my inner cynic has just chipped in with "Don't you think they would be bigging up the amount of arts and cultural space as much as they could, with whatever they could shoehorn into that category? And anyway why the hell do you think they have changed it to square footage now when they could have just cut and pasted the previous numbers?" I'll be posting information, renderings and more comments on here when they become available - apparently by Thursday on the developers site here. In the meantime, you can read my previous posts about this project by searching 'convoys' in the box on the right hand side. Please add comments below if you found out any more interesting information at the exhibition. Meanwhile the Shipwright's Palace has posted an incredibly beautiful and moving description of what things could be like if the imaginations and ambitions of our local experts, campaigners and visionaries are nurtured and allowed to participate fully in this process. To me it looks like a new Pepys Estate, it's absolutely atrocious and why do none of their plans include the usage of the only deep water landing site in London! is this the best we can expect for one of London's most important historic sites? Is there something to do against this plan? I live on Watergate street and want to do something not sure what the local initiatives are. Lewisham's target for affordable housing in developments of over 10 units is 50%, though I'm not aware of any large development where planning have actually enforced this rather than allowing the developers to reduce it, claiming it's not financially viable. Loampit Vale only went ahead after receiving millions of pounds of money from the HCA for social housing (even then it's well short of 50%), but somehow I suspect that under this government such funding will be less forthcoming . . .
What are the implications for both public transport in the area plus how many private cars will this bring into the area? Seems like madness to me. I can't see how such a huge residential development can work in such a densely populated area but then this seems to be happening all over London. What is important for Watergate Street residents is how they are affected during the development phases as well as by the developement when completed. For information on the highly adverse impact Watergate Street homes see the developers Environmental Impact Assessment, noise, vibration, air pollution and loss of sunlight from proposed 8-12 stories along Watergate Street. the thing is, the developers like to give the impression that they're 'thinking about the welfare of the local residents' - in fact, they aren't. It arouses public interest but only to try and obfuscate from their real agenda which is to make as many residential units as possible, in a high a building as they can manage, flog them off to whoever will buy them (even 'blind' buyers from the far east) - but also build in to the development a planned obsolescence so that after 30 years or so the whole lot has got to be knocked down and rebuilt! The further reality is that the planning laws are in the developers favour so that the Council(s) have relatively limited powers - the developers will throw as much money as they need to at the project for as long as they need to - in reality that 'thrown money' will be saved by removing as many benefits to the local community from the development as is necessary for the developer to recoup their 'investment'. Its a nasty, cynical business and any benefit to anybody but the developer is coincidental. There's an interesting article published January 2010 on the Greenwich Industrial History blog, which discusses listing and the historical importance of the royal dockyard at Deptford.